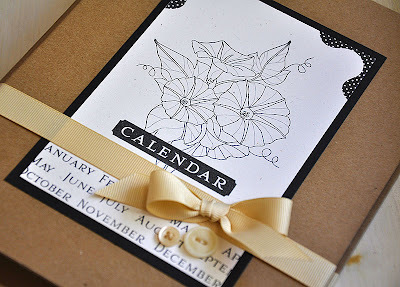 For this months Papertrey Ink Design Team group post, Nichole has asked us to create projects using the new Calender Basics stamp set along with the new pre-printed calender products. Today, I get to share with you the Birthday Calender. Using the Birthday Calender Pages and the coordinating Kraft Folder. I am in love with these products and the final result! I was able to come up with a sturdy, top of the line, better than you can find in any store or boutique Birthday Calender. I just love the look and the feel of this finished project and it's all due to the amazing innovation that went into the creation of these great calender products! And I mean it! Not only am I happy with the products, I am extremely happy with this color combo. Who knew going neutral could be so gorgeous! I think the neutral color combos have become a new fave of mine. So, here is what I came up with... My Birthday Calender and coordinating card. Stamped "CALENDAR" in True Black onto a piece of Rustic White cardstock measuring 5 1/8" X 9 1/4". 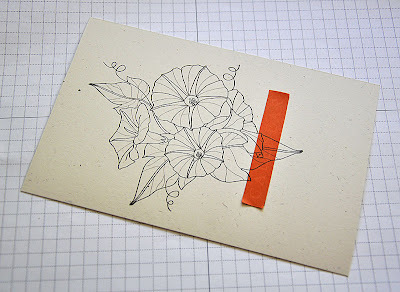 Masked it off and then stamped the morning glory flowers, also in True Black, over the mask. Calender Basics includes a stamp for the name of each month. Which, I lined up onto my acrylic block and stamped onto the bottom of the Rustic White panel. Then stamped the top corners with the polka dot corner embellishment image. Finished the panel off with a True Black cardstock mat and a couple of buttons. 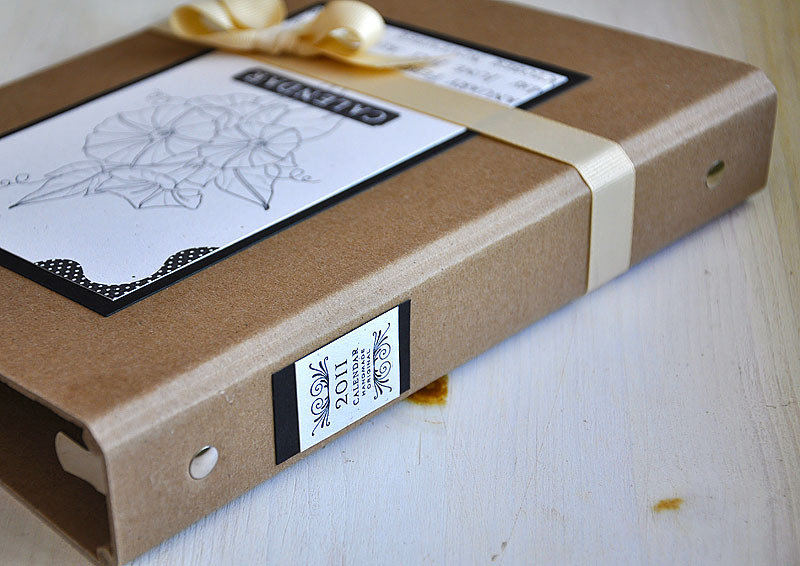 Wrapped Fine Linen grosgrain ribbon around the entire folder. Tied a separate bow and attached it on top of the wrapped ribbon, just above the buttons. 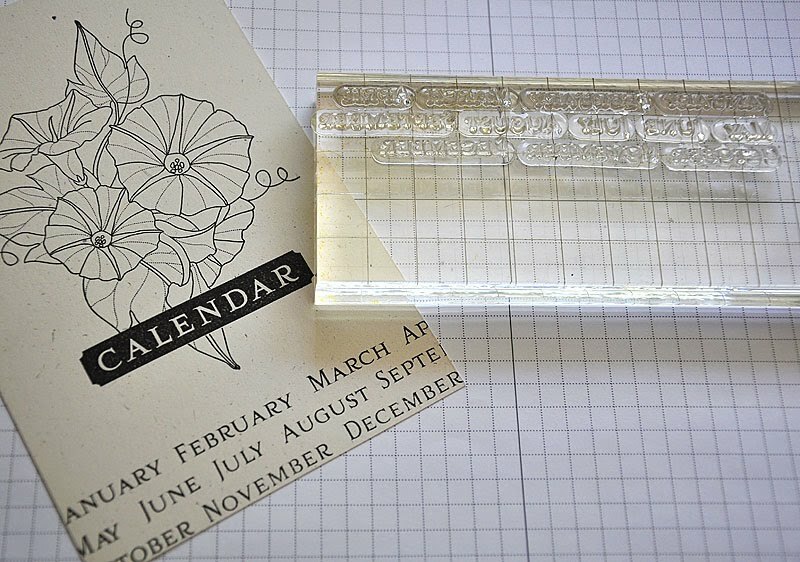 For the spine of the folder I cut a 1" X 2 1/4" piece of Rustic White cardstock and stamped it with both the "Calender Handmade Original" flourish image and "2011". Mat it with True Black cardstock and attached. Inside the folder are these pocket Birthday Calender Pages. On each page is a numbered list, allowing you to jot down and keep track of all the birthday's, anniversary's or events for that month. These pages arrive flat with a scored line which, you fold over and adhere just the top and bottom corners to create a pocket. 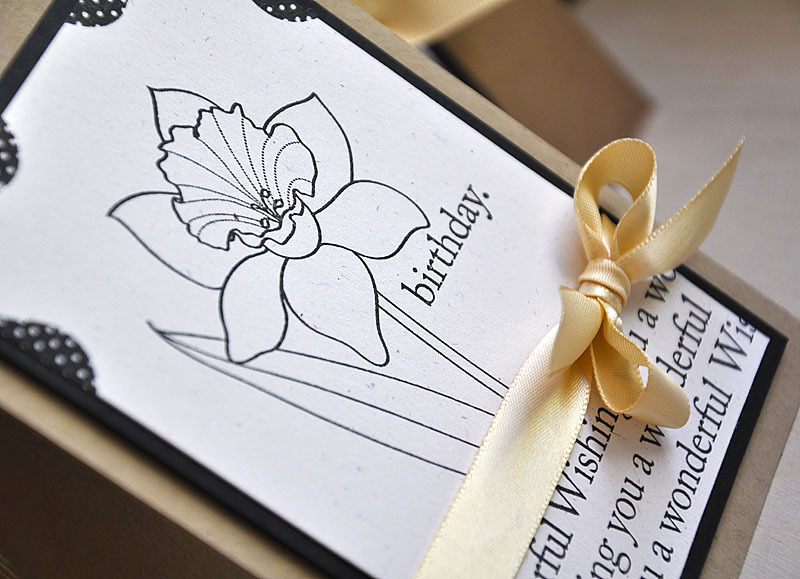 Perfect for storing those needed birthday, anniversary, holiday or special event card. To decorate these pages, I pulled out my Year of Flowers stamp collection. 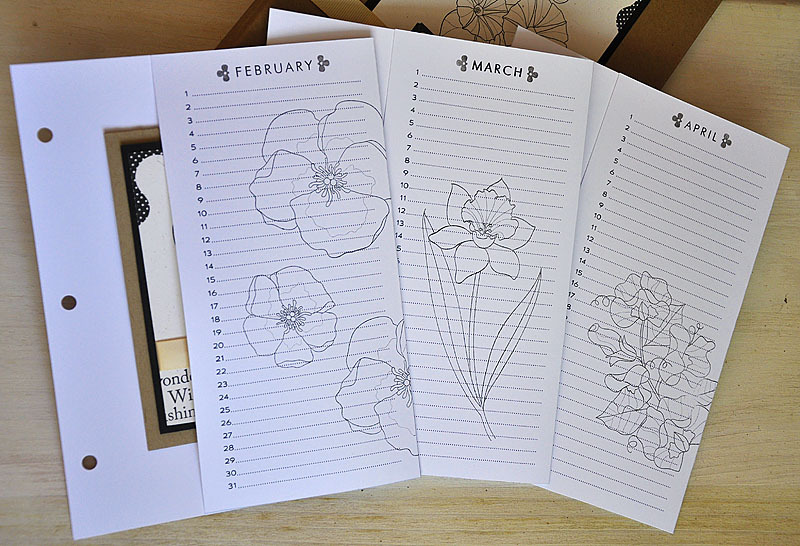 Used the name of the month, included in each set, and stamped it at the top of the sheet in True Black. Embellished either side with a tiny image from Calender Basics, stamped it in True Black onto a scrap piece of cardstock and then onto the sheet. Used this same technique for that months flower stamped amongst the list. 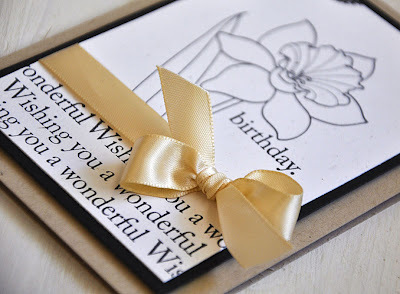 Tucked amongst the pages is this coordinating Birthday Card. Stamped the top corners of a Rustic White panel with the same polka dot corner embellishment in True Black. 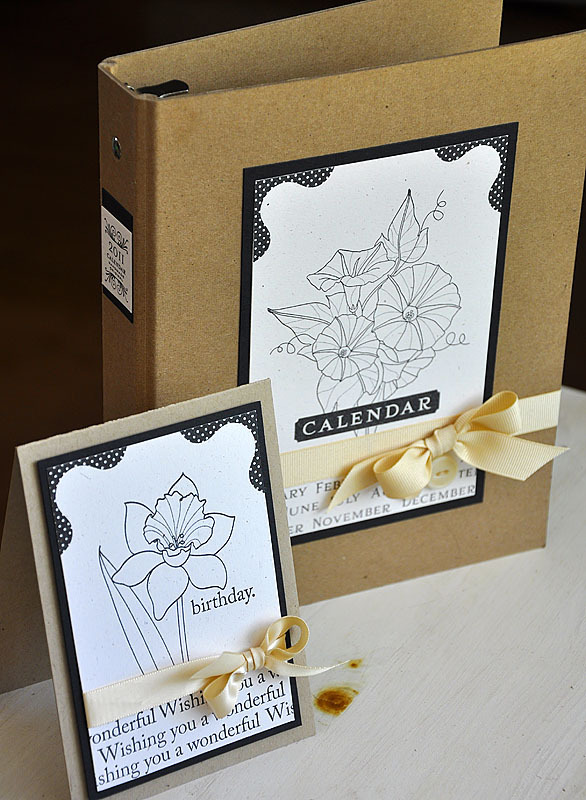 Included in the Calender Basics set are a few commonly used sentiments. Stamped "Wishing you a wonderful" a few times along the bottom. 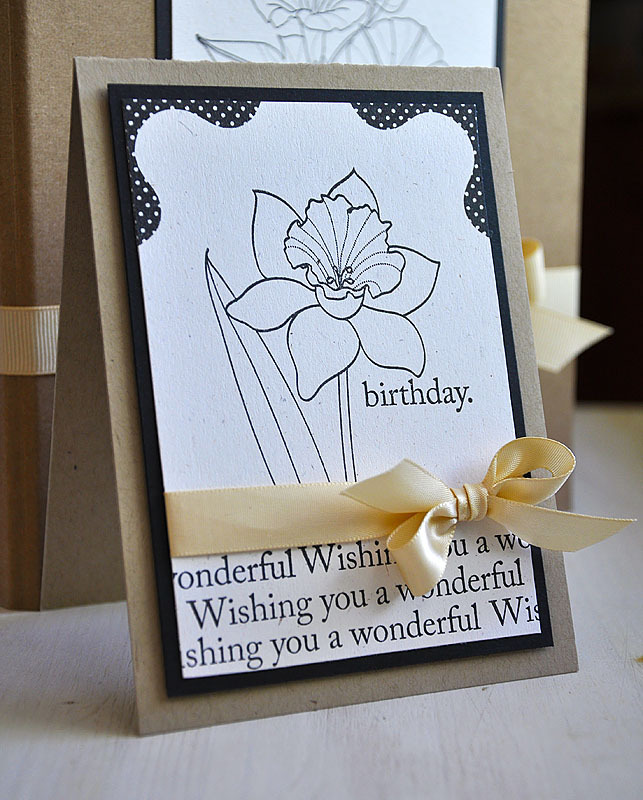 Masked off the bottom and stamped the daffodil from Year of Flowers: Daffodils and "birthday". Then wrapped the panel with Fine Linen satin ribbon, mat with True Black cardstock and attached to the kraft card base with dimensional adhesive. Here's A Tip: To keep thing simple, I opted to ink and stamp the daffodil flower along with only one of the leaves in the image. In the picture above is the the original daffodil image to give you an idea of what I am talking about. So there you have it! I hope you enjoy this project as much as I do. Thanks for visiting and have a great start to your week! What a wonderful project...it looks great! I am always so excited to see what you create with PTI during the countdown and you never disappoint! This project is stunning. truly. I normally never post but you are so talented and thought I would share:) have a great night! Completely knocked this WAY outta the park girl! LOVE this! Your calendar folder is fantastic!! I can't come up with enough wonderful words to express how clever and cool I find your project! Kudos to your creativity. What fun, fun, fun! Thanks for sharing your stunning inspiration! 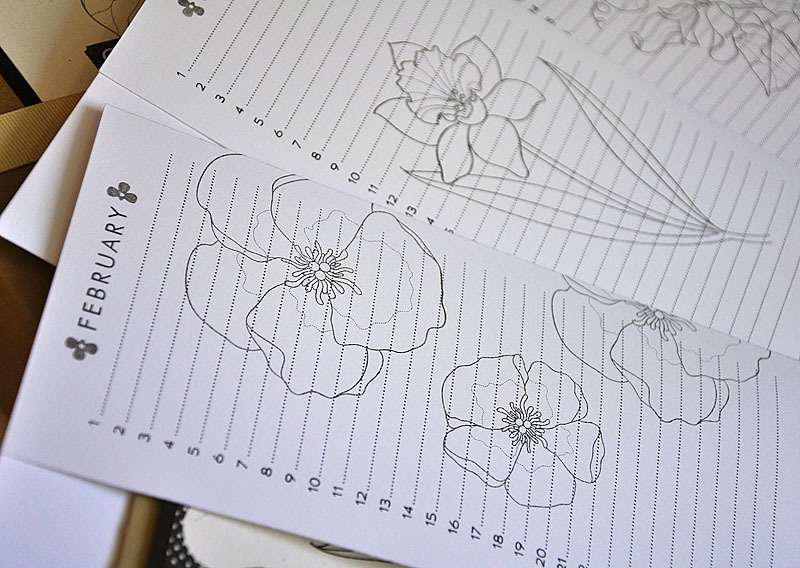 I love the simplicity of the graphic flowers! They look so amazing in black on white. Love the cover so much. Your style is so inspiring! Love the elegance of the black and white design...gorgeous! Absolutely stunning Maile!! Whenever I feel a lack of inspiration, I just scroll through your blog and feel the creativity coming back. Wow Maile this is sóóooo beautiful. Awesome, Maile! Love the black, white, and Fine Linen color scheme, and how you stamped the words at the bottom to make your own background, fabulous! Fabulous, simply fabulous! I love the neutral palette. So beautiful and elegant! Great job!!! Love the simplicity of it all! 'A Year of Flowers" clever! I'm not much of a calendar maker, but your project I can definitely see myself doing for Christmas gifts! This is my favorite of all the DT projects for this new set! Beautiful, elegant, timeless, you've ROCKED this Maile!!! Amazing as always! I love it! Beautiful set, Maile! I love the clean design. Beautiful idea! Love it, Maile! Beautiful design, I knew I'd have to have this month calendar release, now I know I have to fill in the gaps of my YOF stamps! Just stunning. this is lovely, maile. 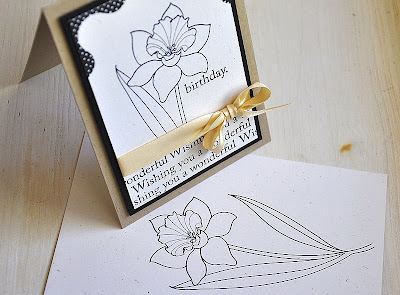 i love your simple, elegant, beautiful stamping style and this project is a knock out! So wonderful Maile! Love the black and white! Beautiful, Maile. And I would never have thought that I would love such a neutral palette so much either. So classy looking! Love the kraft, black, white, and fine linen together. Very classy! It is a project that a) is a thoughtful and pretty gift, b) is practical that someone will actually use, and c) isn't so involved that the project is never finished (I have LOTS of those!). THANKS so much for the great design. Blogs For Boobies Bounce - Final Day!